At this time of year I’m regularly involved in one of a small set of conversations with athletes. Apart from setting next year’s goals they really want to know what training they should be doing now. My Winter Workload post a couple of weeks ago outlined principles for winter training, but I thought I’d provide something more concrete. There’s no reason you couldn’t take my simple Ironman training plans and apply them over winter. They’re built around manageable hours and I believe the sessions are the most important in preparing for an Ironman. Despite that with the winter ahead I’m tweaking the basic pattern for myself and my athletes. Being a general plan the aim is to keep consistency in all three sports with a bias to running. A single sport focus or strong emphasis can give big performance improvements in that area, but need a more specific plan. Don’t rule it out if you’re willing to allow other disciplines to go on the back burner. 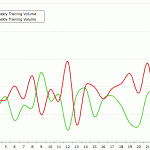 An approach I use with time limited athletes is to cycle the emphasis between training blocks. I dedicate most time to one sport to develop fitness, then maintain it in the subsequent block whilst focussing on another area. Once they’re closer to their race season the cycle becomes more balanced. For the majority of athletes whilst swimming is a limiter the run comes in second. With that in mind my aim is to provide a schedule that should improve running and at least maintain bike fitness. In the pool the goal is consistency with appropriate technique work for performance gains. For those of us looking at a cold winter it has the practical benefit of minimising time spent in unpleasant conditions as the majority of sessions are built to work indoors. Cold, ice, snow and rain are all much easier to deal with running than cycling. It might look familiar as it shares a lot in common with the simple Ironman plan. The hours involved are the same with the time divided over more workouts. Sessions are generally shorter, but if you do them all there’s a few more double training days. Swimming doesn’t impact the rest of my training much so apart from dropping the open water sessions it remains unchanged from previous plans. Three sessions a week covering technique, endurance and threshold, you can read a good summary of this on the Swimsmooth site. If I was keen I’d add a swim on Sunday for a fourth pool session. Cycling is toned back, the assumption is that midweek sessions are indoors and the weekend as an opportunity to get outside. I keep the time on the turbo as efficient as possible with a short, hard interval session and slightly longer threshold session. These accumulate the hard work to prevent a decline in cycling and potentially lead to improvement. The endurance ride is shorter, but there’s no reason not to go further if conditions, fitness and mood allow. Running is the focus so these are at most steady rides to help maintain endurance without too much fatigue. Anything more on the bike is optional if you have the time and can do it without affecting run training. Finally the running is built around frequency and a little more volume. There are no brick runs, whilst they’re time efficient the quality of running on its own is much higher. If time prevents more independent run sessions, then brick running is better than not running. There are three key sessions with the rest of the mileage being at an easy to steady pace. Initially I keep all the sessions generic and certainly exclude delibrate speed or interval work. I’m more concerned with logging time on the legs and developing the strength to support harder training in the future. There’s a lot of impact and load involved in running and jumping straight into high paced work is risky. I’d rather see short run races used to spice things up than track sessions, but no more than fortnightly. At the least simply repeating this routine week after week would get you through winter in good shape to build for a new season. If you want to take things further and make more progress it’s important that training load is increasing over time. You can achieve this by increasing the volume or intensity of work, remember winter isn’t a time to entirely drop intensity. In line with the run emphasis I’d not plan to make changes to the volume of swimming or cycling. An occasional performance test can be used to help ensure you keep working at the same relative intensity in the sessions. You’re not aiming for a breakthrough in either of them and trying to do more could limit the gains to be made on the run. Run training load should be primarily progressed by increasing the volume of each workout, expanding the key sessions of endurance, tempo and hill work in particular. If time allows another option is adding additional easier run sessions. Over time the pace of these sessions should increase, but initially focus on the time and distance involved. At higher run volumes I think it’s important to take an easier run week. My plans build for three weeks, back down for the fourth, then enter the next cycle at a higher level. It’s a lesson learnt from the summer’s mega-mileage, so many consecutive weeks of hard running inevitably lead to a protracted recovery period. To really take winter’s training further you need to have a plan specific to your needs. Generic training templates can only give so much. I’ve put it together as an example of the approach I think works well for winter. It aims to be practical given the weather conditions and to allow an athlete to progress their performance for the next season.